When I sang with famed choral conductor William Hall several decades ago, he used to say that the hardest type of a program for a choir to sing was one with a dozen small, anthem-sized pieces. “It’s much easier to prepare Bach’s B-Minor Mass,” he said with a grimace. For the penultimate program in the Los Angeles Master Chorale’s 2016-2017, Artistic Director Grant Gershon defied that perspective with a program that included 14 anthem-sized works (counting two encores) and one larger piece (Vaughan Williams’ Mass in G minor). To no one’s great the Chorale pulled it off beautifully. The program was titled “Wade in the Water,” which Gershon said in his preconcert talk was to convey, “Music of the spirit and music of renewal.” Assistant Conductor Jenny Wong termed the evening one of “humility and harmony.” The title came from a spiritual of the same name arranged by Moses Hogan that was the second piece performed. During the program. Gershon began with a twist. For the opening work, Stand in That River by Moira Smiley, Gershon had the singers enter the hall down four staircases leading from the Orchestra View level to the stage where they arranged themselves not in the four standard groups (soprano, alto, tenor, bass) but mixed together with two men standing next to two women who were next to two other men, etc. It made for a more homogenous sound throughout the evening. The only work where that wasn’t the case was Vaughan Williams’ Williams Mass in G minor, which was written for double choir and four soloists. The two choirs were arranged in the Chorale’s standard horseshoe setup rather than being spatially separated but they sang this treacherous a cappella work with elegant precision. The solo quartet, perched on an elevated riser behind the other singers, sounded like a separate choir when they sang together. The quartet — Andrea Zomorodian, soprano; Laura Smith Rethe, mezzo soprano; Michael Lichtenaur, tenor; and James Hayden, bass— sang with a purity of tone that resembled English singers. Lichtenaur was particularly effective in his solo lines. All of the evening’s soloists were Master Chorale members. They included soprano Zanaida Robles, who delivered delicate but heartfelt lines in Wade in the Water, and later received a standing ovation for her gripping arrangement of Lift Every Voice and Sing, which included powerful solos from mezzo-soprano soloist Garineh Avakian. The second half of the program opened with the Chorale delivering top-flight diction and intonation in The Word was God, a complex anthem by Rosephanye Powell. They continued with Randall Thompson’s famous Alleluia; the Alice Parker/Robert Shaw arrangement of Amazing Grace, which featured a luscious solo by tenor Nate Widelitz; and Bright Morning Star by Master Chorale member and former LAMC Composer-in-Residence Shawn Kirchner, with bass-baritone Luc Kleimer as the sensitive soloist. A noble rendition of Moses Hogan’s arrangement of the hymn, Abide With Me, and rollicking account of Rockin’ Jerusalem as arranged by Rollo Dillworth closed the formal part of the program. Wong conducted the first encore: another arrangement of the “Ubi Caritas” text, this one by Welsh composer Paul Mealor, which was written in 2011 for the wedding of Prince William and Catherine Middleton. Gershon then capped the evening by leading a luscious account of Deep River, third Moses Hogan arrangement during the evening. There were several different ways to experience the Los Angeles Master Chorale’s 28th annual High School Choral Festival this afternoon in Walt Disney Concert Hall. You could start with the observation that it was amazing that 1,000 students from 29 high schools could actually be quiet at the same time, not once but several times! Not only that, they managed to get into their seats not once but twice nearly on time, a logistical feat approximating the D-Day landings on Normandy. One could also be amazed at the technical prowess of the combined forces who were seated in the orchestra and orchestra view seats surrounding the Disney Hall stage. In seven pieces that ranged from Handel’s Your Voices Tune to several contemporary pieces, the students — led by LAMC Artistic Director Grant Gershon — sang with impressive diction and articulation and managed to create a wonderfully harmonious sound in those pieces where harmonies were at their lushest. Two of the pieces — Bring Me Little Water, Silvy and Stand in that River — were by guest artist Moira Smiley (actually, as she explained, the former was a Ledbelly tune), who was on hand to teach the performers the percussion to accompany Bring Me Little Water, Silvy. Although students learned all of the music ahead of time, somehow everything managed to come together in a morning’s rehearsal, yet another amazing feat. Midway through the choral concert, Gershon led 91 singers selected from the participating schools who comprised the Festival Honor Choir in three difficult, contemporary songs from around the world. The ensemble acquitted itself with distinction during this set; the final work — Tiptipa Kemmakem by Philippine-born composer Nilo Alcala — was particularly intricate in its time signatures. Another aspect of the concert was to experience the amazing acoustics of Disney Hall, the second day in a row where that was the case (read my review of last night’s Los Angeles Philharmonic HERE). Although Disney Hall is one of the world’s great orchestra halls, it is best during choral concerts, especially during soft moments. Today was actually three separate programs, beginning with a performance by the 16-voice L.A. Master Chorale Chamber Singers, led by MC Assistant Conductor Jenny Wong. Considering that she memorized the entire 40-minute set, this may well have been part of her Doctor of Musical Arts degree program at USC’s Thornton School of Music. She conducted the set with expressive hands and careful attention to the pieces’ many moods, and the singers’ tone resonated throughout the hall. Among the highlights was Wir Juden (We Jews), a new composition by 18-year-old USC freshman Lucy McKnight. The moving, five-minute work, McKnight’s first choral piece, was selected as the winner of the Master Chorale’s second annual Young Composers’ Competition and is based on a poem by Gertrud Kolmar, a German-Jewish writer who died at the Auschwitz concentration camp in 1943. The hit for the assembled students was True Colors by Billy Steinberg and Tom Kelly, as arranged by Saunder Choi. The students were given colored lights and encouraged to illuminate them at appropriate times; the results made for a dazzling light display to accompany the singing. After the Chamber Singers’ program, organist John West gave a demonstration of the Disney Hall organ, beginning with Bach’s Toccata in D Minor and ending with a Star Wars medley that brought forth the waving light show once again. A good time was had by all, especially those who had never heard this instrument! Prior to the afternoon program, the 29 choral directors were honored onstage with certificates from the Master Chorale. Later, Gershon paid tribute to his high school choral teachers and encouraged the students to keep on singing. “God knows we need harmony in our lives today,” he said. 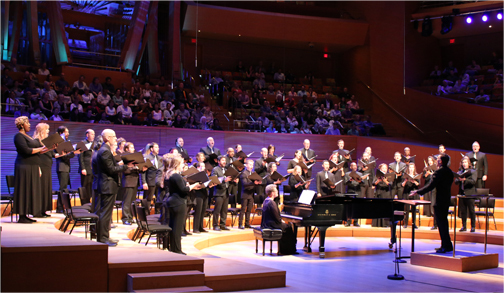 Members of the Los Angeles Master Chorale perform in “Lagrime di San Pietro” last fall. A possible tour of the production, which received widespread critical acclaim, was part of the Master Chorale’s presentation of its 2017-18 season at Walt Disney Concert Hall. Once upon a time, not so many years ago, classical music organizations made a big deal of announcing their upcoming seasons. Most were a waste of time. The presentations weren’t well done (I can still remember Plácido Domingo reading the media release at one such occasion) and the news could have just as easily been disseminated by emailing a release, which is what usually happens these days. This morning the Los Angeles Master Chorale revived the old tradition with a concise, informative event that included — for a change — some genuine news, well presented by Artistic Director Grant Gershon, President and CEO Jean Davidson and others who will be involved in the upcoming season, the Master Chorale’s 54th and Gershon’s 17th as the ensemble’s AD. • The Chorale has now remade itself as a fully professional ensemble. 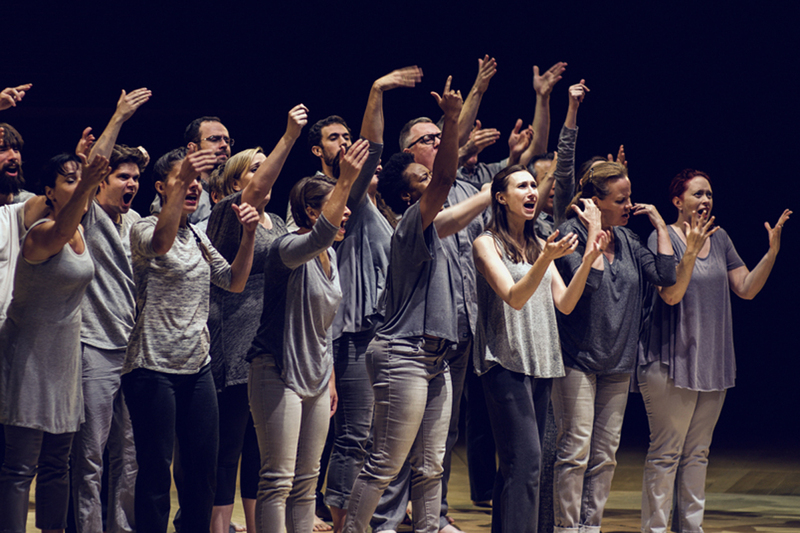 At 100 members it’s one of the largest fully professional choral groups in the world. • Gershon will conduct six of the nine concerts (12 performances) in the upcoming season, which begins on Sept. 23 and 24 with Leonard Bernstein’s Chichester Psalms and Orff’s Carmina Burana and concludes on June 9 and 10, 2018 with Brahms’ Ein deutsches Requiem and works by Caroline Shaw and David Lang. The Bernstein piece is part of a world-wide celebration of the centennial of Lenny’s birthday (Aug. 25, 2018). • In addition to the main season the LAMC will headline “Big Sing California,” a project led by LAMC Artist-in-Residence Eric Whitacre. The year-long event begins with a mass sing in Grant Park on June 24 as part of the 2017 Chorus America conference and will conclude in July, 2018 when people around the world will join together via a live stream to sing with the Whitacre and the Master Chorale performing in Disney Hall. • In the second installment of the LAMC’s “Hidden Handel” cycle, Gershon and 80 singers will sing Israel in Egypt in collaboration with visual artist Kevork Mourad. A clip on Mourad’s vision for this piece and his artistic style is HERE. • Gershon will lead performances of Handel’s Messiah on Dec. 17 and the 27th annual “Messiah Sing-Along” on Dec. 18. This year is the 275th anniversary of the work’s premiere. • Maria Guinand, conductor of Venezuala’s Schola Cantorum and head of the choral portion of the country’s El Sistema program, will lead a program on Oct. 29 of Latin American music as part of the annual “Dia de Los Muertos (Day of the Dead)” remembrance. • Jenny Wong, the Master Chorale’s new assistant conductor, will lead a concert of Bach’s Six Motets on Dec. 10 and Whitacre will lead “Festival of Carols” concerts on Dec. 2 and 9. Gershon ended the gathering by telling those assembled that plans are being developed to take the production of Orlando di Lasso’s Lagrime di San Pietro (Tears of St. Peter) on the road. My preview of the concert is HERE. Mark Swed’s L.A. Times review is HERE. Details to come, we are promised.